Looking for a reasonable yet hilarious game? This classic Knock your Block Off is your party rental answer. Teens and adults will be entertained for hours. This interactive rental knock you block off goes well with a number of other rentals we offer. 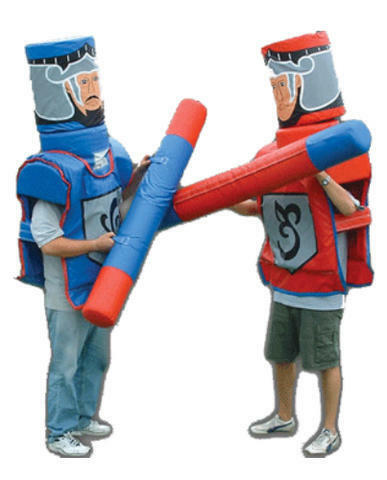 For example, imagine a battle against your boss in our inflatable boxing ring? That would be a great sight at a company picnic rental! Or at a graduation party, where the graduate gets to defend himself on one of our fun bouncy inflatables. The knock your block off party event can be so fun, you just need some creativity and excitement to make it happen! This interactive game is to knock the velcroed head off your competitors shoulders. Ages 12 and up. If your order with out an inflatable a $40 non inflatable fee will be added.